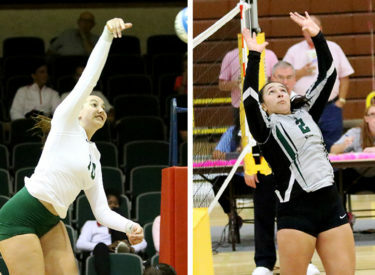 LIBERAL, Kan. – Two Seward County volleyball players came away with conference awards this week as Giovanna Tapigliani won the Jayhawk West Player of the Week and Giovanna Kuntze won the Jayhawk West Setter of the Week. For the second time this season, Tapigliani was named Player of the Week for the Jayhawk West. Tapigliani helped lead the No. 5 Lady Saints to three straight sweeps last weeks with a team-high 39 kills on the week. Her 19 kills against Dodge City were the most by a Lady Saint in a three-set match since 2007, when sets went to 30 points. She finished the week with 4.3 kills per set, connecting on nearly half of her attempts, hitting .493. This is the fifth time that Kuntze has been named Jayhawk West Setter of the Week. Kuntze made the most of her playing this team, racking up 78 assists in only seven sets played. While she paced the Lady Saints all week, she made her attacks count as well, hitting .429 in the three matches. She also came away with over 2.5 digs per set. The Lady Saints will host Barton on Wednesday (Oct. 28) at 6:30 p.m. in the Greenhouse.